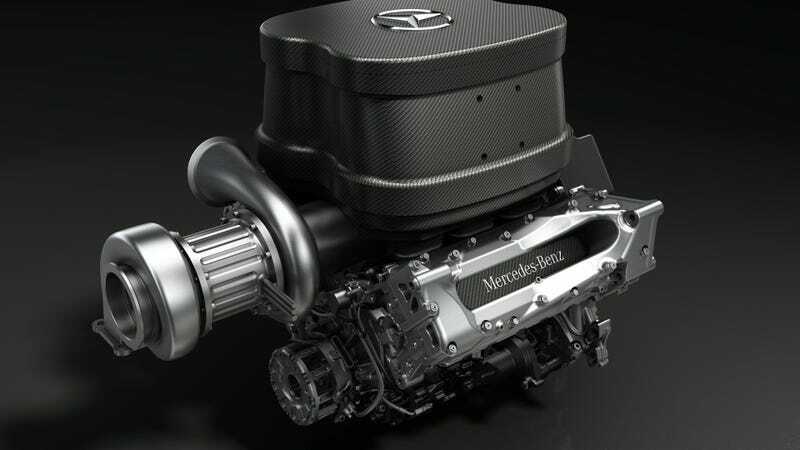 Starting in 2014, Mercedes AMG will supply engines to four of Formula One's 11 teams: McLaren, Mercedes, Force India, and Williams. It looks like the Germans are taking over F1. Formula One is switching from 2.4-liter V8s to 1.6-liter turbocharged V6s in 2014. This is going to be a huge change for the sport, with a greater emphasis on fuel efficiency (teams have to make the whole 300km race distance on 100kg of fuel), and road car technology. Not many cars are running naturally aspirated V8s anymore, but small displacement turbocharged engines are everywhere. The big switches are that the engine redline will drop from 18,000 to 15,000 RPM, though we get the cool statistic that the Mercedes turbocharger will be running at 125,000 RPM. One British journalist who heard the engine running on the dyno said that the turbo will be "audible." Translating that from English understatement to a more American descriptive style, I can assure you the turbos will sound "louder than two deaf cats getting eaten by an alligator." I'll also point out that Formula One's safety car, medical car, and many of its transport trucks come from Mercedes, the only big luxury car manufacturer in the sport. Technically, when I say that the Germans are taking over F1, I really mean that the Brits are. Mercedes' F1 engines are made in the UK just like almost everything else in F1. Oh, and while Williams jumps ship from Renault, Scuderia Toro Rosso is switching from Ferrari engines to Renault ones, making all Red Bull teams Renault-powered.